International student awards scheme The Rookies has released its 2018 rankings for the world’s best CG schools, rating the performance of 580 schools in 87 countries. The USA’s Gnomon – School of VFX and Animation for Film and Games topped the Animation rankings for the second year running, also being rated the world’s best school for visual effects. Other category winners were unchanged from 2017, with Belgium’s Howest leading in game development, the USA’s SCAD in motion graphics, and Australia’s CDW Studios and Flinders University in illustration. This year’s awards attracted entries from 2,914 students worldwide, up 6% on last year. 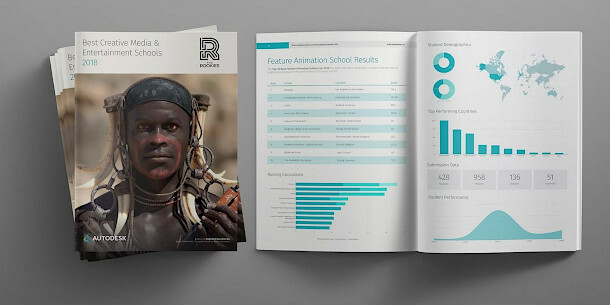 Students’ portfolios were judged by a panel of VFX, games and concept artists including illustrator and concept designer John Howe and Rob Coleman, Oscar-nominated head of animation at Animal Logic. US school Gnomon was rated best in the world for both animation and visual effects in the 2018 rankings. In four of the five categories, 2017’s leading school retained its top spot: Gnomon for animation, Howest for game development, SCAD for motion graphics and CDW Studios and Flinders University for illustration. The sole change was Gnomon, which displaced Germany’s Filmakademie Baden-Württemberg as the world’s leading school for visual effects. By our count, 33 schools from North America, Europe, Asia and Australia reached at least one top ten, with the following 11 placing in more than one category. Asterisks indicate a school new to this list in 2018.